Maitria Hotel Sukhumvit 18’s Loved by Hotels.com Guests! In testament to providing a truly “Stay Savvy” experience in the heart of Bangkok’s famous Sukhumvit Road the management and staff at Maitria Hotel Sukhumvit 18 – A Chatrium Collection were both delighted and proud to learn the hotel had won a “Loved by Guests 2017” award from the renowned Hotels.com, one of the world’s largest online booking websites, with an impressive guest review rating of 4.3 out of 5. Hotels.com is well-known for offering travelers the very best deals on accommodation and lists over 325,000 hotels in approximately 19,000 locations on its website. The annual “Loved by Guests” awards are based on authentic, trusted reviews submitted by Hotel.com’s customers who have actually stayed in the properties who win, meaning their opinions truly count towards choosing the best accommodation around before starting your travels. 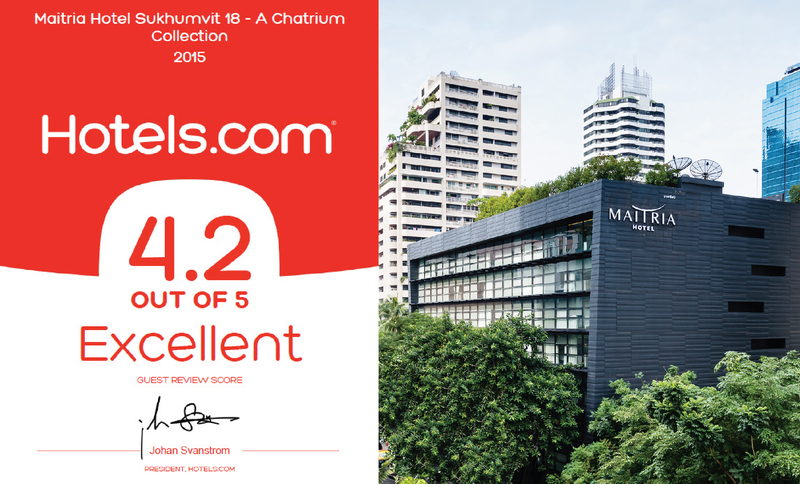 So if you’re looking for a “Stay Savvy” vacation with the seal of approval from the customers of Hotel.com look no further than Maitria Hotel Sukhumvit 18 – A Chatrium Collection.